Shrewsbury Town have made their first summer signing by agreeing a deal with defender Alex McQuade following his release by Bolton. The 20-year-old, who is yet to make his professional debut, is to sign a one-year deal after impressing in two trial games at left-back for Town's reserves. "He can play as a left-sided central defender as well," said Shrewsbury manager Graham Turner. "He's a player who has got a lot going for him and has a lot of potential." 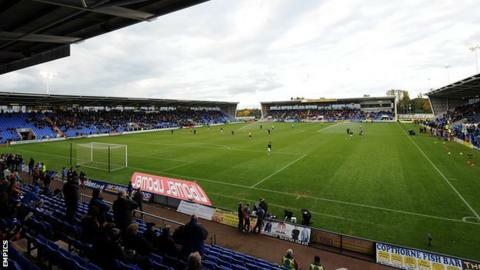 Shrewsbury Town have not offered new contracts to Mark Wright, Marvin Morgan, Rob Purdie, Matt Richards and Ryan Doble following the completion of their League One campaign. McQuade has come through the ranks at Bolton where one of his coaches at Under-18 level was former Shrewsbury midfielder Tony Kelly, a great favourite in two seasons at the Gay Meadow from 1989 to 1991. "He impressed us in the two reserve matches he's played," added Turner. "And we've had him watched on a number of occasions for Bolton's development side. "We've got Joe Jacobson who is established at left-back and has played really well for us towards the end of the season and responded well to being made skipper. "But Alex is another 20-year-old who can be the nucleus of the future for the club and he's coming over to sign for us on a one-year contract." After finishing 16th in their first season back at the third tier of English football since 1997, Turner appears to be putting even more emphasis on youth next season. He let five players go when he issued his end-of-season retained list on Monday, including club skipper Matt Richards and striker Marvin Morgan. But he has long-term injury worries over two of last season's first-choice defenders Darren Jones and Jermaine Grandison.